You can edit custom contact fields right from the Manage Fields page in your account. Renaming the custom contact field. Editing the personalization tag for the field. Adding or changing the default value to a field. Adding/removing answer options to radio, check box, list box, and dropdown field types and rearrange their answer options. Unchecking the "Visible on forms" option. This means that you will not be able to use that specific field on any forms you create. Making the field available to specific lists. By default, all fields are available to all lists. If you do not want a field to be used with a list, click "Advanced Options” then unselect the list assignment for the field. Only contacts in the checked list(s) will have that field on their contact profile page. This is also helpful if you only want to display specific fields in your notifications. Organizing fields by group. 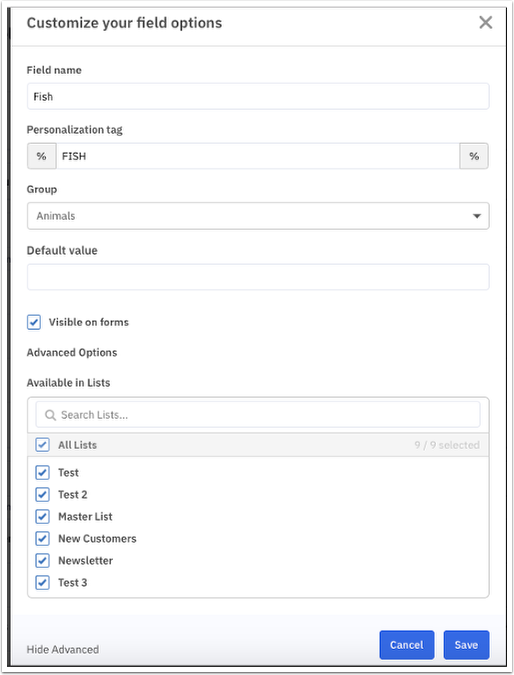 For example, you can add a custom contact field to a field group, move a custom contact field from one group to another, reorder fields within a group, and reorder field groups. Click "Forms" or "Lists" in the leftside menu. Hover your mouse over the field you wish to edit and click the pencil icon. A “Customize your field options” modal will appear. Make your desired edits and click "Save." It's not possible to convert one field type into another, however, you can insert the value of one custom field into another by following these instructions. [Video] How do I add a default value to a personalization tag?